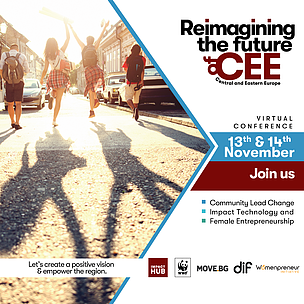 WWF in Central and Eastern Europe is proud to partner in the first ever virtual conference of Impact Hub in the region on 13 November 2018 (10am-1pm CET/ 11am-2pm EET) and 14 November 2018 (10am-4pm CET/ 11am-5pm EET). WWF, together with its partners Impact Hub and Move.BG are organizing a virtual conference focused on Central and Eastern Europe. The vision: three tracks as part of the Disruptive Innovation Festival (DIF) that aim to sketch a positive vision for Central and Eastern Europe, and empower citizens by showcasing impactful initiatives from and for the region. In very interactive formats (including Panels, Worldcafe, Workshops, Breakout Conversations and Speed-dating) participants will have the opportunity to hear from and interact with speakers from across the region, and take part in the conversations. The focus will be on Hungary, Bulgaria, Romania, Croatia, Serbia, Czech Republic and Ukraine, but everyone interested in the topics or the region is more than welcome to join the conversation. You are invited to pick the topic most relevant to you on the DIF page, where you will also find the Eventbrite link for the registration so we can share the necessary info with you. Each track is between 2-3 hours long and will include a variety of speakers (5+ for each track) and different formats. All free of charge - impact first. What are the 3 tracks? Introduce different organizations that support female entrepreneurs through knowledge, networking, investment, and even tax advice. Finally, we will use our own experience and gained knowledge to draft a vision of what the future of Female Entrepreneurship should look like, and pin down concrete milestones necessary to get there. If you are a recent or future female founder / entrepreneur, investing in women, the supporter of female entrepreneurs or simply interested in topics such as blockchain, supporting entrepreneurs or feminism, then join us! Men are welcome, too. Especially in Eastern Europe, rural and urban communities are painfully separated - economically, socially, technologically and culturally. This makes grassroots (community driven) change very unlikely. Furthermore, entrepreneurial initiatives coming from “outside” a community are mostly seen as unwanted interventions that face suspicion and resistance. Change emerging from and for communities, therefore, is needed in the region. Join us if you are a professional working in social innovation, an Impact Investor, from a development agency, an NGO professional, a community leader or simply a caring citizen. Technology impacts the environment, people and society as a whole. The way we use technology determines whether its impact is positive or negative. We invite you to jointly explore how to use technology as a tool for positive impact and how to redesign the way we understand it. We will learn from inspirational stories that show how technology helps us to deal with various issues in the context of Central and Eastern Europe and beyond. You will hear from a recently shot documentary about the impact of civic technology in CEE and discuss how disaster relief applications from Mexico might support the region in the future. What are the trends, barriers and future of impact technologies? Jointly, we will discuss and develop a vision of where impact technology will be three years from now, and define milestones that need to be achieved to realize this vision. Let’s see where our dream of a virtual conference will take us. Join us if you want to learn, get inspired and be part of the conversations. Or, simply because you want to see if the concept of a virtual conference can actually work.